A recent report published by Infinium Global Research on automated microscopy market provides in depth analysis of segments and sub-segments in global as well as regional automated microscopy market. The study also highlights the impact of drivers, restraints and macro indicators on the global and regional automated microscopy market over the short term as well as long term. The report is a comprehensive presentation of trends, forecast and dollar values of global automated microscopy market. According to report the global automated microscopy market is projected to grow at a CAGR of 9.1% over the forecast period of 2018-2024. Automated microscopy is an advance technology that uses advance-monitoring techniques such as atomic force microscopy called as AFM that enhances monitoring of biological specimen. Automated microscopy adjusts and determines the light shutter, wavelength selection, focus, and stage control. It also acts as the illumination source for live-cell imaging and software for live-cell imaging in an electromechanical way. Automated microscopy gives accurate and automatic magnifying for investigating and understanding the subject and helps to reduce manual mistakes. Automated microscopy market finds widespread applications in semiconductors, surface study, life science, material science, diagnosis, genetic engineering. Increasing number of application along with development of user friendly and less complex microscope are driving the growth of the automated microscopy market. Additionally, government and industrial investment in inventing automated microscope for Nano technology is anticipated to boost the growth of the automated microscopy market. However, high prices owing to more technical advances in the equipment’s is the major restrain for the automated microscopy market over the forecast period. On the other hand, automated microscopy market is likely to be hampered by instrumentation complexities that have to be addressed before using automated microscopes. In addition, increasing number of biotech, pharma, & healthcare companies worldwide are anticipated to bloom the market for automated microscopy. Among the geography, Asia pacific accounted for the largest market share for the global automated microscopy market followed by North America. Additionally, the presence of large number of manufacturers particularly in japan and favorable government supports has led the dominance in the Asia pacific regions. Additionally the growing investment in research and development and low labor cost are likely to hold the dominance of the Asia pacific regional market over the forecast period. On the other hand, cost effective manufacturing of the devices, growing healthcare infrastructure and tremendous funding toward modern technologies are further accelerating the growth of the automated microscopy market. The report on global automated microscopy market covers segments such as, product and application. On the basis of product the global automated microscopy market is categorized into inverted microscope, fluorescence microscope, electron microscope, scanning probe microscope and optical microscope. On the basis of application the global automated microscopy market is categorized into nanotechnology, medical diagnostics, life science monitoring, material science and semiconductors. The report provides profiles of the companies in the global automated microscopy market such as, Asylum Research, Agilent Technologies Inc., Bruker Corporation, Carl Zeiss, Fei Company, Hitachi High Technologies Ltd, Nikon Corp and Olympus Corp. The report provides deep insights on demand forecasts, market trends and micro and macro indicators. In addition, this report provides insights on the factors that are driving and restraining the global automated microscopy market. Moreover, IGR-Growth Matrix analysis given in the report brings an insight on the investment areas that existing or new market players can consider. 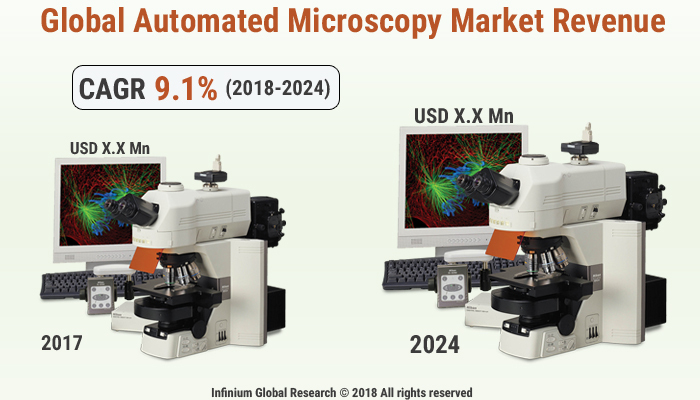 The report provides insights into the market using analytical tools such as Porter's five forces analysis and DRO analysis of automated microscopy market. Moreover, the study highlights current market trends and provides forecast from 2018-2024. We also have highlighted future trends in the automated microscopy market that will impact the demand during the forecast period. Moreover, the competitive analysis given in each regional market brings an insight on the market share of the leading players. This report will help manufacturers, suppliers and distributors of the automated microscopy market to understand the present and future trends in this market and formulate their strategies accordingly.